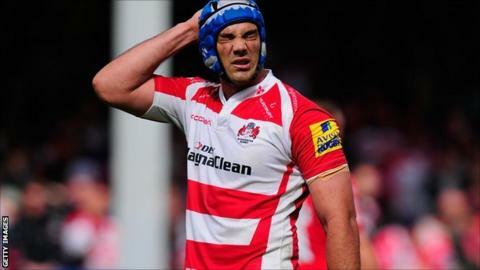 Gloucester have been docked two points and fined £5,000 for fielding an ineligible player, Mariano Galarza. The Cherry and Whites selected Galarza to face Sale Sharks in a league match on 29 March, but the Argentine "did not hold effective registration". The two-point deduction had initially been suspended for two years, but after an appeal by the Rugby Football Union the deduction will be immediate. Gloucester will not appeal but described the ruling as "unduly harsh". "We're disappointed by the RFU decision to appeal against the original outcome and subsequent decision," they added. And in a statement Gloucester said they "can only hope that the reasons were fact based and not due to pressure from other parties". The statement concluded: "In the interests of moving on, and looking forward to the start of a new season, we have accepted the decision and now consider the matter closed." The points deduction does not affect the Cherry and Reds' ninth-place finish in the Premiership table as they ended the season eight points ahead of 10th-placed London Irish. Gloucester confirmed the signing of lock Galarza, 28, in February 2014 from Worcester Warriors.